Ah China... the US financial market's scapegoat of choice for many a swing that has nothing to do with China (with a few big, notable exceptions). Last Friday brought the biggest day of bond market weakness we've seen in a while and Chinese economic data got the credit. This week, then, provides ample opportunity to see just how much US markets really care about the Chinese economy as we'll get several big economic reports tomorrow including Industrial Output, Retail Sales, and GDP. Not only that, but GDP is the first reading for Q1 and it's expected to show a continued slide, albeit a small one, from 6.4% previously to 6.3%. If it happens to rise instead of fall, one would expect a big, negative reaction in US bond markets if last Friday is any indication. The other two reports are equally important. They're both expected to rebound, so if they move lower instead, one would expect a nice recovery in US bond markets (again, that's IF last Friday is any indication, and we're not 100% sure it is yet). Meanwhile, the US will be waiting until Thursday for it's first big data of the week in the form of Retail Sales for March (expected to come in at 0.9% versus February's -0.2%). That makes Thursday a potentially volatile and interesting trading day due to the 3.5 day weekend beginning that afternoon (early close on Thursday and full closure Friday for the Good Friday holiday). 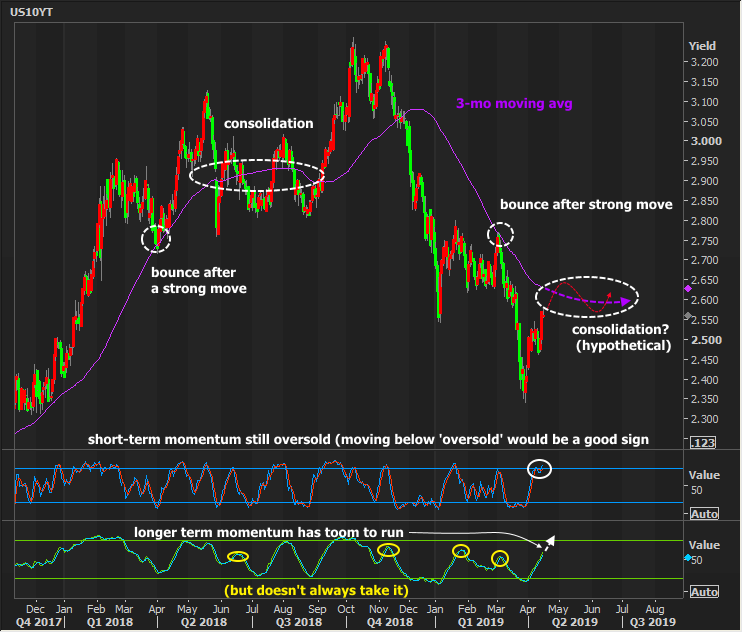 From a technical perspective, it wouldn't be the end of the world to see yields move a bit higher in pursuit of a sideways consolidation near the 3-month moving average or in pursuit of 'oversold' slow stochastics (that's the upper green line in the bottom of the following chart). This isn't offered as a prediction--simply as one possibility with the caveat that additional weakness wouldn't necessarily be the end of the world just as consolidation this past Summer wasn't the end of the unpleasant move toward higher yields in 2018.